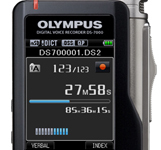 The DS-7000 sets a new industry standard in professional dictation equipment. Designed for professional who rely on secure, flexible, reliable products as integral parts of their office workflow, it features real-time 256-bit file encryption, a redesigned, independently housed microphone, enhanced battery life and include next-generation Olympus Dictation Management Systems (ODMS) software. The DS 7000 256 bit AES encryption system protect the encrypted data from illegal access. 256 bit AES is supported when recording in DSS Pro format. The AES encryption system meet the high security standard set by governments worldwide for securing data. In addition to securing the data, the DS-7000 Device Lock feature protect the device from unauthorized access using 4-digit PIN code. comfortably and naturally when holding the DS-7000. recording and playback using optional foot switch. This hands-free solution allows the author to dictate into a high quality digital recorder and then connect tthe recorder to a computer for download and automatic transfer to your transcriptionist or voice recognition program. New Color Display - Olympus has integrated a 2 inch LCD color display. The display shows battery status, recording time, folder info, volume control. Display bar progress bar. Microphone - The microphone is bigger and independently housed to reduce pickup of movement and bumps.- The new microphone has a frequency pick up 16Khz/28kbps flawlessly reproducing sound.- The mic improves the pick-up for use with Nuance Dragon voice recognition. The New Slide Switch - The new slide switch is patterned after a microcassette recorder with Record/Stop/play/Rewind on a single control. The slide is more rugged an durable than before and 50% more durable. 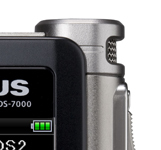 The improved controls on the DS-7000, color LCD screen, security and enhanced battery life mark a new industry standard in professional dictation. Supports both SD and microSD cards via separate slots allowing for expansion up to 32GB of total memory. LCD supports and displays multiple languages, including English, French and Spanish. This is a Heavy Duty foot switch designed for Olympus DS-5000 and DS4000. This commercial grade 3-fucntion foot control will not disappoint. The large buttons prevent your foot from accidentally hitting the wrong function and its solid, metal base keeps it from sliding around during use. The GN1 gooseneck microphone is modular in design with a sturdy dull-coat finish black base, a flexible 18" shaft and a phantom-powered, uni directional microphone. The GN1 gooseneck microphone is modular in design with a sturdy dull-coat finish black base, a flexible 18" shaft and a phantom-powered, uni directional microphone. A 10' cord and a 3.5mm mono plug add to the versatility of this gooseneck microphone making it the ideal choice for hands-free directional activities. The USB switch is a convinient way to have your computer connect to your recorder and disconnect after it is done with out the need to mess with your cables or setup. It allows you to do your work and be done. I am a doctor in a hospital and received their email marketing ads which explained Dictation Pack for Pathology which is my specialty, I needed one for my own office. Called and spoke with Schulze, he gave me a better price with free shipping. Thank you.